Water parks are a time-honoured holiday tradition, and a great way to beat the summer heat while stewing in strangers’ bodily fluids. Really, there’s no shortage of things to do at a water park: You can lounge in the lazy river, splash around on a slide, and even contract Hep A! The possibilities are endless. If you’re looking to cool off on your summer holiday and encounter all sorts of bacteria, look no further than the wave pool. These socially-acceptable cesspools are teeming with all your favourite bugs — if you’re lucky, you might even find a used tampon or diaper, like I did as a kid. While colds are temporary, chlorine can’t bleach away the haunting memory. Speaking of chlorine, according to microbiologist Tara Smith, the popular chemical doesn’t actually “clean” the wave pool. While the chlorination process is intended to kill most common germs that might be present, it isn’t guaranteed to prevent you from contracting an illness. It certainly won’t stop you from swallowing pee — in fact, pee interacts with chlorine to create a slew of nasty chemical byproducts that can lead to red eyes, and respiratory problems. 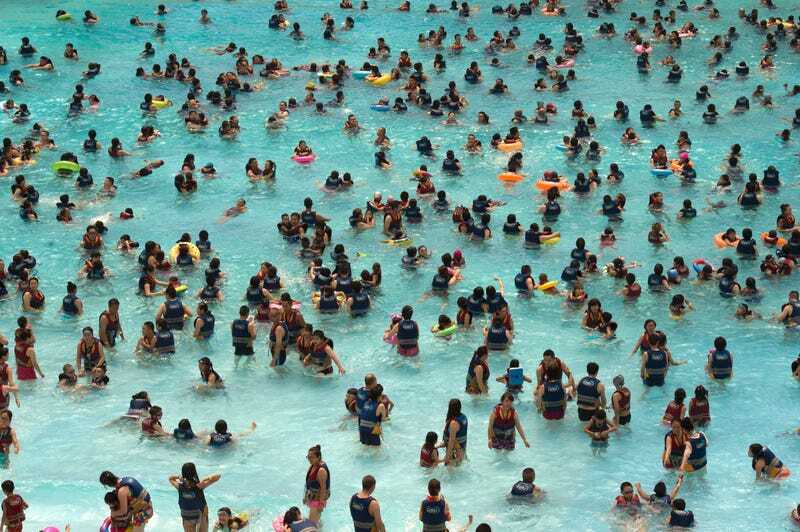 Wave pools are full of people, and people are full of germs. Chances are, the some of those germy flesh sacks in the wave pool are carrying around certain strains of bacteria, viruses, and even parasites that can evade the normal chlorination regimen and infect others. According to the Centers for Disease Control (CDC), cryptosporidium outbreaks — which are linked to swimming pools and “water playgrounds” — doubled between 2014 and 2016. The parasite is transmitted when a person comes into contact with the faecal matter of a sick person — and yes, it can survive chlorine treatments. Crypto outbreaks last year “highlight the ongoing challenges that treated recreational water venues have with Crypto due to how difficult it is to kill and the small number of germs that can make people sick,” the CDC says. Obviously, if you must go in the wave pool this summer, it’s best not to swallow the water — unless you’re looking to get the full water park experience, involving days of diarrhoea and regret. Water parks are fine, and sometimes, even fun! Just remember to shower before and after going into the wave pool. Or, just don’t go in the wave pool at all — it’s a goddamn petri dish of nightmares.